We’ve been sailiing the ocean blue for days now, or so we think…we’re already saying things like, “Did that happen only yesterday?” it seems like so much longer already! On Saturday morning the texts were flying as everyone boarded shuttles for the ship. As you saw on Facebook, we had our boxes loaded and ready early; Kris and I hired a shuttle to take us and them crafty goodness to the port. our driver was such a character….he said he’d been n Vietnam, so I asked, “Army?” I thought it was a yes or no question, but it turned into a half hour story of his amazing life! From a troubled youth to a disastrous prison term when he was pulled out of jail with 300 men for special unit in Vietnam—300 went on the mission, he and 11 others survived. He returned, made a mint and lost it, and was personally reponsible for much of the computer revolution…and all of this because he was so dangerously good looking. LOL! Much may have been a fish tale, but I choose to believe him – making a movie of the story would be brilliant! Our OWHers slowly started finding each other. Well, started finding Kris and I! We felt like celebs being recognized everywhere. We set a time and place to meet to wave to the webcam…so most of us did gather for that. We took some photos (better ones to come, we have a pro on board with us! ), and it was clear we would be fast friends….this is one great group of women! It was about this time I found out little miss Ciara was being a bad bad girl…oh my! She has never done anything like this while being dogsat, but she ate through two doors and tried to enlarges doggie door in the side of a house!!!! She has been removed from there and I begged her usual sitters to take her for the week lest she cause me even. Oe thousands in damages. Agh! I hope she started behaving! Those folks have no Internet so I have nreports, but I emailed someone to call and check on her. Our first dinner was the first time we were mostly together, and even then was divided between early and late seatings. But at least it was one place where we got word to all to meet in our conference room at 9pm. However – we had no stuff! Security had called me aside earlier for a meeting to question items – the guy had a homeland we unity badge! Deep! However once through the explanation of what we were all about to him and the other staff at this big meeting, they were fine with things; we just had to promise to lock up all our dangerous scissors. And save them a few supplies so they could come in and make a card too, they all wanted to pop in and join us! Lol, ain’t that how it goes! Our items arrived in our room, but not in time to do any crafting Saturday night, so. Everyone went to bed while Kris and I played Santa….it was like stuffing stockings to.go through everyone’s totes and fill them up! 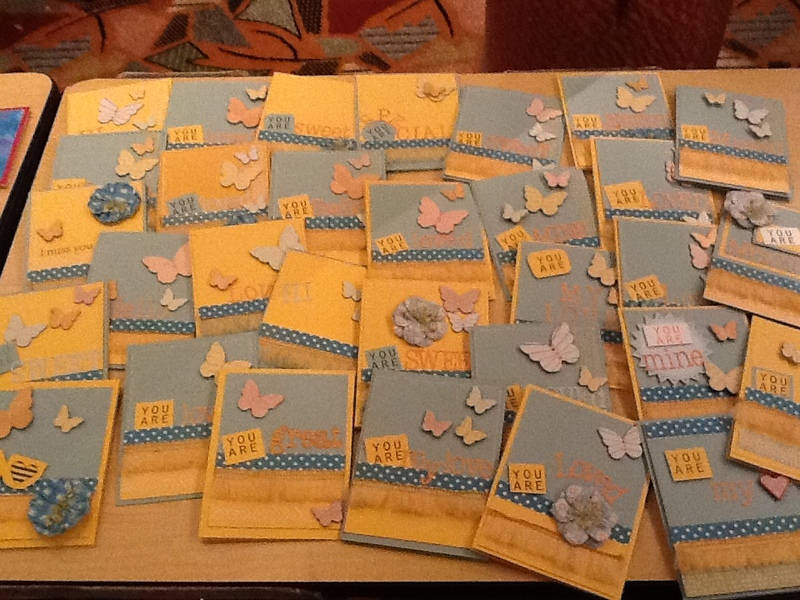 Sunday morning the crafters arrived bright eyed and bushy tailed for our first class: shading! It was hard, I put them through their paces on exercises with lighting and oranges. We looked at how light falls on an object, where shadows rest, and started looking at how the shapes we studied play out in the stamped images we colored. It was the first step for a lot of folks, so we’ll be adding more ideas to the coloring toolkit as the week wears oN. 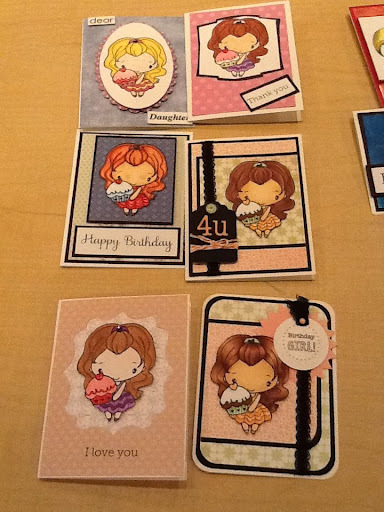 The afternoon class was this fun shabby chick card made from goodies in our Studio Calico kits…look at the variety in how everyone chose to embellish! It was Super Bowl Sunday, and that was a similar mania hee as it is back home. People talked trash all over….I was cheering for the Giants, ha ing lived in NY for years,….so fortunately I get to go find the ship staff member who I dueled with during our muster drill, and of course give him my “condolences!” Our ladies did get to wat h the second half of the game; our dinner was during the first half, but we requested the game. E piped into the craft room for us. We turned over 300 kids coloring pages with the cruise ship digi on them for the kids program to color….I hope to get over there and get some photos! Late into the evening I and the night owls made cards after everyone went to bed; we plan a pajama party one night, and I’ll see about ordering a 2am pizza maybe! Our ship’s group coordinator, Diana, gives me the same answer to all my requests: “No problem!” so we will see! I hope to figure out if uStream will work from the ship, so maybe we could try a short chat; Internet here is like dial up, so it might not be possible, but we’ll gi e it a try and see! We would love to say hi to everyone back home! Looks like you are having a blast! Keep having fun for all of us!!!! 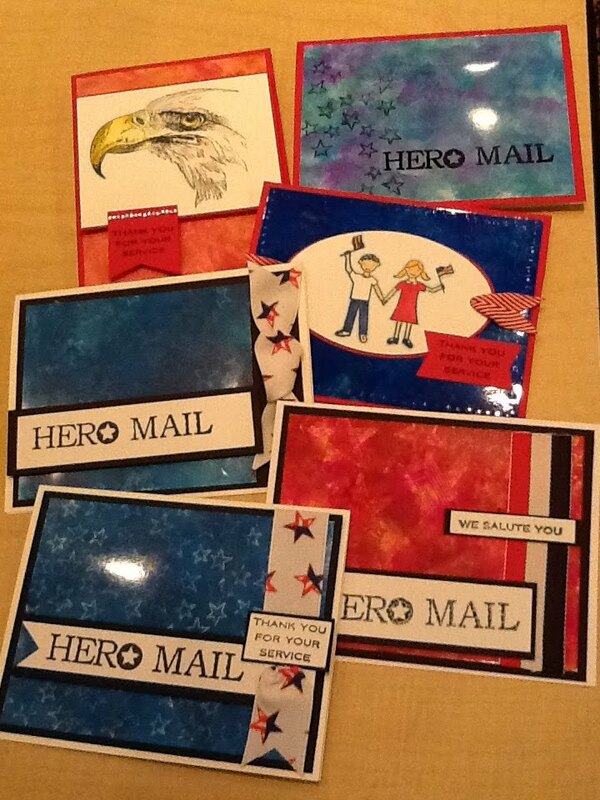 Looks like a lot of fun and your getting lots of cards made for the heros. Yay! !